“The datasets we’re making available today to further humanities research are based on a subset of that corpus, weighing in at 500 billion words from 5.2 million books in Chinese, English, French, German, Russian, and Spanish. The datasets contain phrases of up to five words with counts of how often they occurred in each year. 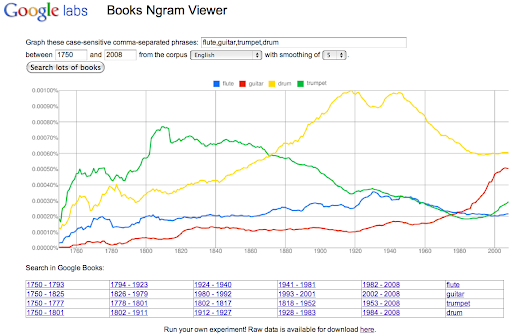 (…) The Ngram Viewer lets you graph and compare phrases from these datasets over time, showing how their usage has waxed and waned over the years,” says Jon Orwant, from the Google Books team. 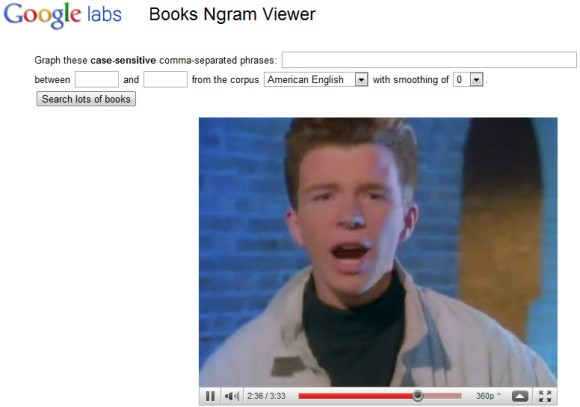 Rickrolling seems to be Google’s favorite prank. 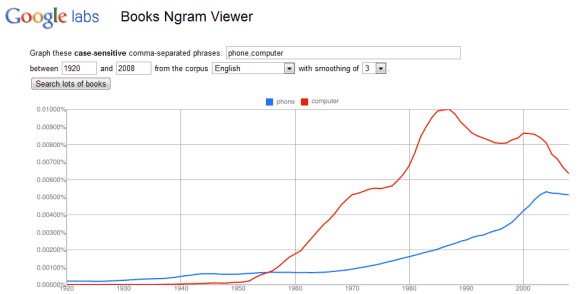 If you try to search for [never gonna give you up] in Google’s recently launched Ngram viewer, you’ll have a pleasant surprise: a YouTube video of Rick Astley’s “Never Gonna Give You Up”. Ever wonder just how many different books there are in the world? After some intensive analysis, we’ve come up with a number. Standing on the shoulders of giants—libraries and cataloging organizations—and based on our computational resources and experience of organizing millions of books through our Books Library Project and Books Partner Program since 2004, we’ve determined that number. 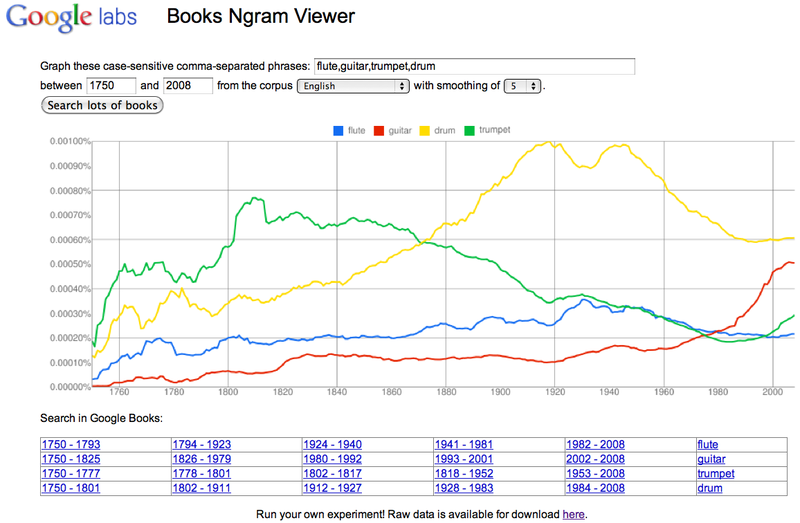 As of today, we estimate that there are 129,864,880 different books in the world. That’s a lot of knowledge captured in the written word! This calculation used an algorithm that combines books information from multiple sources including libraries, WorldCat, national union catalogs and commercial providers. And the actual number of books is always increasing. Ultimately, it is truly incredible to fathom the depth and breadth of published works out there in the world. To find out how we calculated this number (no, we didn’t count them on our fingers:), check out the Google Books blog. In recent months, I’ve got to know a group of people in the Hague who are working on an ambitious project to make the rich fabric of Dutch cultural and political history as widely accessible as possible – via the Internet. That team is from the National Library of the Netherlands, the Koninklijke Bibliotheek (KB), and as of today, we’ll be working in partnership to add to the library’s own extensive digitisation efforts. We’ll be scanning more than 160,000 of its public domain books, and making this collection available globally via Google Books. The library will receive copies of the scans so that they can also be viewed via the library’s website. And significantly for Europe, the library also plans to make the digitised works available via Europeana, Europe’s cultural portal. The books we’ll be scanning constitute nearly the library’s entire collection of out-of-copyright books, written during the 18th and 19th centuries. The collection covers a tumultuous period of Dutch history, which saw the establishment of the country’s constitution and its parliamentary democracy. Anyone interested in Dutch history will be able to access and view a fascinating range of works by prominent Dutch thinkers, statesmen, poets and academics and gain new insights into the development of the Netherlands as a nation state. This is the third agreement we’ve announced in Europe this year, following our projects with the Italian Ministry of Cultural Heritage and the Austrian National Library. The Dutch national library is already well underway with its own ambitious scanning programme, which will eventually see all of its Dutch books, newspapers and periodicals from 1470 onwards being made available online. By any measure, this is a huge task, requiring significant resources, and we’re pleased to be able to help the library accelerate towards its goal of making all Dutch books accessible anywhere in the world, at the click of a mouse. It’s exciting to note just how many libraries and cultural ministries are now looking to preserve and improve access to their collections by bringing them online. Much of humanity’s cultural, historical, scientific and religious knowledge, collected and curated over centuries, sits in Europe’s libraries, and its great to see that we are all striving towards the same goal of improving access to knowledge for all. Google and other technology companies have an important role to play in achieving this goal, and we hope that by partnering with major European cultural institutions such as the Dutch national library, we will be able to accelerate the rapid growth of Europe’s digital library.